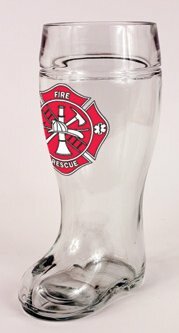 This popular, glassware drinking vessel features firefighter fire rescue Maltese Cross emblem decoration. Beer boots are an excellent topic of conversation. The secret to drinking from the boot is to point the toe sideways. When the toe is pointed downward, the boot cannot be easily emptied. When the toe is pointed upwards, the liquid flows out of the boot very quickly and uncontrollably, usually spilling all over the drinker. Machine made in Poland.